I have a bad habit. I love to make pieces that become instant favorites! This necklace, The Rachel, named for my best friend who suggested the basic color scheme, is one of those instant favorites. 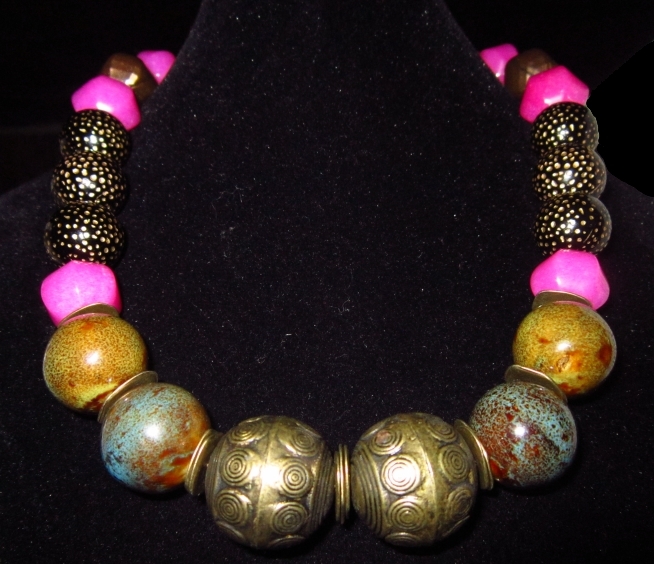 It is bohemian, one-of-a-kind, and full of color and texture. If you don't like to receive compliments, or have pieces that you can wear with a host of colors and for almost any occasion, then this isn't the necklace for you! But, if you do love to hear, "Where did you get that?" or "Wow, what a necklace!" then The Rachel is definitely a Bohemian Earth design you should seriously consider (and, you'll know that you are the only person wearing this one-of-a-kind piece)! 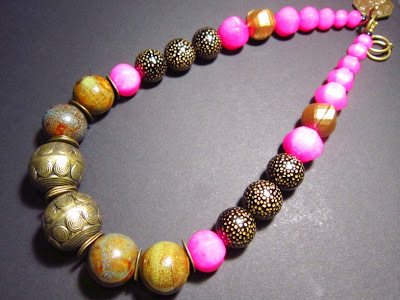 Many materials went into this necklace's design. It features hot pink jade gemstones, six black and gold Lucite globes, two vintage faceted aged gold Lucite beads from Turkey with an amazing pattern, four ceramic globes with beautiful greens, browns, and a touch of turquoise blue, and two antiqued brass Bali style beads, which make Earthy, tribal, and bohemian centerpieces. 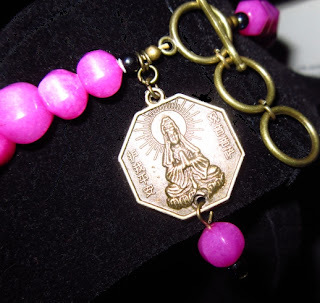 Antique bronze discs are interspersed in the front third of the necklace and two sparkly blue goldstone beads, an adjustable clasp, and an antique bronze Kwan Yin charm with pink jade and blue goldstone dangle complete the necklace. 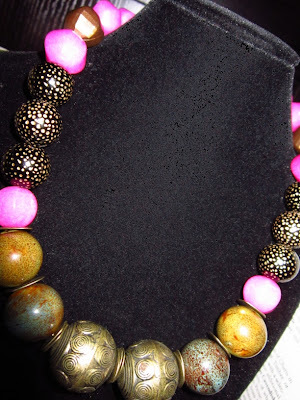 The necklace looks great with a range of colors from black to white to pink and even yellow. This is due to its many hues that are enhanced even more by light. When I bought the ceramic globes in New Mexico years ago, I loved their color along with their pattern and texture. 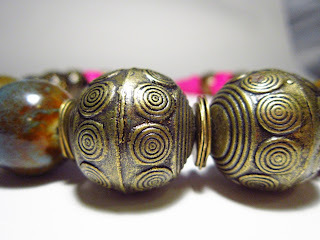 I use these globes sparingly and I think this design wouldn't be complete without them! The black and gold Lucite balls are textured and pick up the color of the centerpieces and vintage beads. Wow. I really love this design, and I know you will also! Looks amazing with so many colors! The is necklace is of moderate weight and measures 18 1/4" at its shortest length to 19 1/4" at its longest length. The largest globes are just under an inch in diameter. The dangle near the clasp is about 1 1/2" long and the Kwan Yin charm is the size of a quarter. Buy The Rachel here on Etsy. See the earrings this necklace inspired here and buy them here on Etsy. My Stormy Neptune earrings also go well with this necklace. Read about them here and buy them on Etsy.